Exhibiting at an event isn’t a cheap affair. Often, it costs lots of money to rent out floor space and travel to the event, as well as the cost of buying your actual exhibition display stand. The end goal of spending a large portion of your marketing budget on exhibiting is to generate client leads and make a return on your investment. As ideal and simple as this sounds, lots of businesses often don’t make any profit from attending events. The reason? A poorly executed exhibition stand. You may have spent hundreds - or even thousands - of pounds on your display, but that doesn’t guarantee that it will get you results. The key to seeing real results is largely down to design. An unappealing exhibition stand will turn visitors off and ruin your chances of seeing your investment money come back to you. Design can be a tricky thing to nail and is something that doesn’t come with clear instructions. This is because every business is unique, has different goals and attends different types of events aimed at varying clientele. There is no right or wrong answer to graphic design, however; there are a handful of nifty tricks you can employ to ensure your exhibition stand is more eye-catching than all the others and, in turn, stands a much higher chance of boosting your profits. Strong imagery is what will stand out the most to a passing visitor at any event. A solid image will prompt potential customers to investigate your stand a bit further; finding out about your business, what you do and how you can benefit them. High resolution pictures are essential. Pixelated imagery that is blurry and unclear will be instantly recognisable and will deter people away from your stand. Invest money in a decent photographer who will use their creative flair to provide you with something high-calibre and fit for purpose. If you opt to not have pictures on your exhibition, make sure your logo or background pattern is equally as high resolution and sharp. Crisp graphics can be the make or break when it comes to exhibiting – make sure your business doesn’t fall at the first hurdle. Here at XL Displays, we produce thousands of exhibition stands and display solutions every year. This means we see plenty of imagery come through our doors. We are no strangers to high quality graphics, but that doesn’t stop us being taken aback when we see crisp and clean images that truly stand out. A prime example of strong graphics is this pop up stand we manufactured for our client DMC Canotec. With such prominent graphics, this exhibition stand could have easily gone so wrong if the image was blurry or pixelated. Fortunately, the customer provided us with high resolution imagery that printed to a stellar quality finish. The end result was a high impact display that guaranteed our customer an eye-catching exhibition stand that will draw in visitors easily and effortlessly. Along with imagery, colour is a high ranking factor when it comes to the success of an exhibition stand. The line between contrasting and clashing can be a fine one, but it is one that – when not crossed – can give your business desirable and fruitful results. Colours that are consistent with your company’s branding are a good option, but not essential. The key to selecting the right colours is to ensure that whatever shade you pick is vibrant. Dull colours are not interesting, they simply blend in to the background. This isn’t enticing and has the adverse effect. Bright, sunny colours or deep, dark colours contrast with the background of exhibition halls and tempt visitors more than neutral shades. Our client, Virgin Money, excelled with their use of strong colours on a pop up exhibition stand we produced for them. Whilst the colours were not uniform to Virgin’s branding, it worked well. Despite this, white exhibitions can look just as interesting as colourful ones. Provided the display is not overcrowded and looks fresh, white is a good option for simplistic marketing that is still effective. Once you have peaked the interest of exhibition goers through the medium of imagery and colour, the next thing visitors will pay attention to is the text on your display. Many businesses make the mistake of cramming their exhibition stands with too much text. Not only is it hard to make dense paragraphs look good, it is a waste of time. The purpose of an exhibition display is not to showcase your business’ life story and dreams. Its purpose is to grab attention; the rest falls to the business rep and their customer service skills. Most people won’t stand there and read a massive paragraph. In fact, they’ll more than likely be turned off by it. For this reason, it is key to keep text to a minimum. Stick to highlighting key points. Short bullet points work well. Always include your brand name and slogan, and it’s a good idea to also clearly state your website address and any social media handles you have. 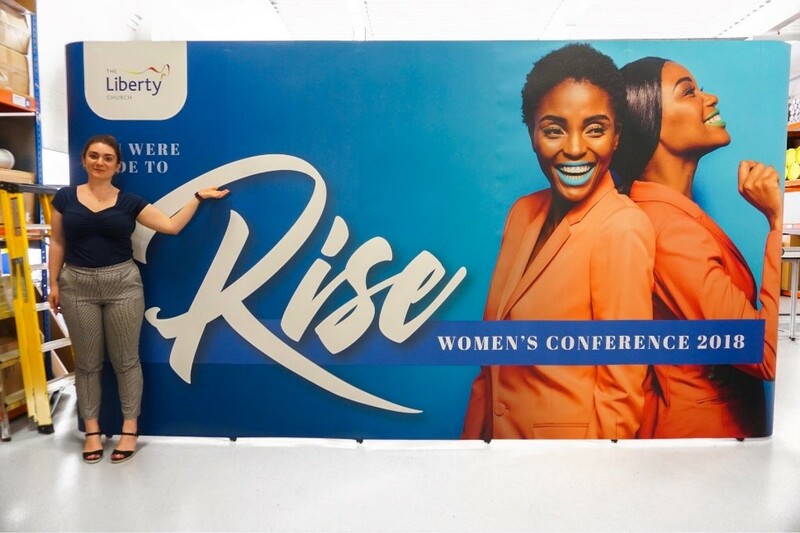 Our client, The Liberty Church, did an excellent job with regards to text proportion on their pop up exhibition stand. They included their logo, their slogan and the name of their event. Despite there only being 11 words in total, the stand is high velocity and informative enough, but it doesn’t give everything away – meaning people have to go over to the stand and strike up conversation. The good thing about this is that it increases the chances of closing a deal and increasing profits. Once you’ve enthralled visitors and persuaded them to come over to your exhibition stand, the next thing they will be looking for is organisation. Like with anything, if you are unorganised, it reflects badly on your business. It shows clients that you don’t particularly care. If you don’t take pride in your display, what’s to say you will take pride in helping customers? If you lack attention to detail with your own business, will you be any better when it comes to clients’ needs? Whilst you may think a few misplaced leaflets here and there or graphics that aren’t lined up perfectly aren’t a big deal, they are. You need to provide visitors with a sense of direction. No one likes to feel confused or as if everything is simply going with the flow. Whilst you may be winging your exhibition, you can’t let customers know that. By creating either a direct or indirect customer journey, you are showing initiative and experience. An indirect customer journey may consist of using a promotional counter as a meet and greet or reception area for customers to come to as a first port of call. This shows them exactly where they need to go when they come over to your stand and controls the footfall so that you are not swarmed by several people at once. Our customer, Marketing Delivery, came to us with a very clear plan of what they wanted for their event. They were keen to create a customer journey that not only promoted their brand, but one that looked good visually. 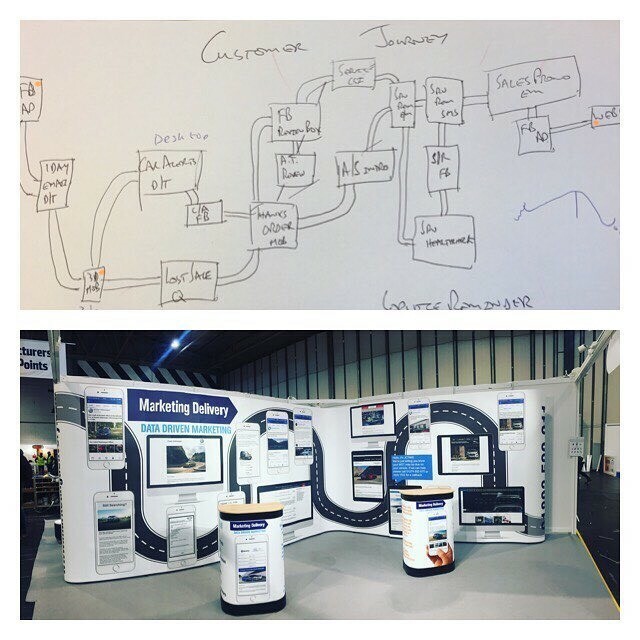 We were able to help them create their ideal exhibition stand by taking their original sketch and working closely with them to develop a design that worked. The final result was hugely successful and attracted an abundance of visitors to their stand. It enabled the business representatives at the event to remain calm and collected as a result of the high-quality organisation. People notice things that are different from all the rest, and exhibitions are no exception. 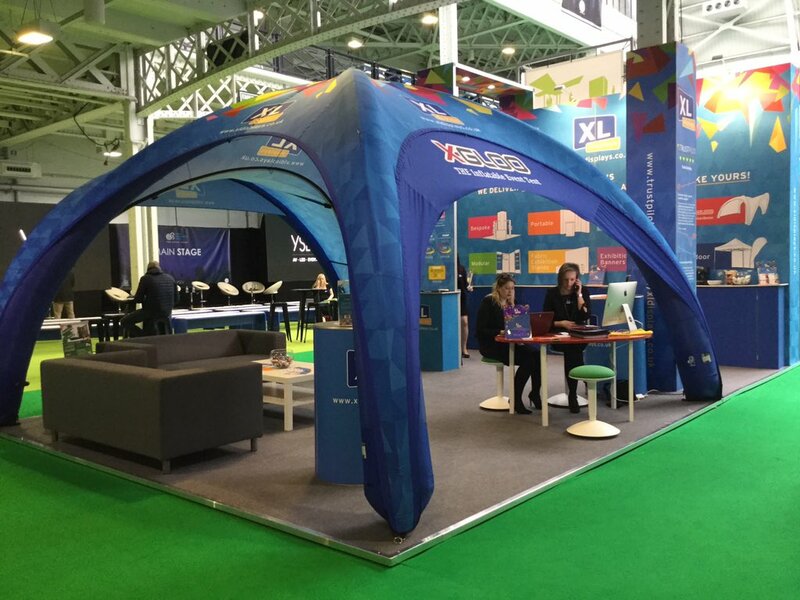 Here at XL, we manufacture the largest range of exhibition stand solutions in the UK, so we offer plenty of choice for you to pick something that is really unique. Modular exhibition stands are ideal choices if you want to invest in an exhibition stand that can adapt alongside your business needs. Modular stands allow you to add or detract elements of your stand as and when you need to, making them easy to manipulate to fit any exhibition space. Centro exhibition stands are one of our bestselling modular solutions because the possibilities are endless. Centro displays employ a unique Rotrlink system, which means that they simply twist and lock into place. Graphic panels are laminated to ensure that they are crease, tear and scratch proof. They are then attached to the Centro hardware using magnetic tape. Self assembly couldn’t be easier. One of the biggest advantages a Centro display system has is that it offers unrivalled multimedia opportunities. Monitor brackets and literature stands can be built in, allowing you to add an interactive element to your exhibition stand without taking up precious floor space. Twist flexible displays are another excellent modular exhibition stand solution. Twist comprises of patented tension banners that stay aligned and taut, even on uneven surfaces. Several banners can be joined together in any formation to suit whatever space you are exhibiting in. Like with Centro, the graphics are laminated for extra longevity, and a multitude of accessories can be added to customise your display. Choose from monitor stands, shelving solutions and lighting to really enhance your Twist banner system. Here at XL Displays, we are popular for our quality linked pop up stands. Available in a wide variety of sizes, linked pop ups are stellar choices for creating a stand-out exhibition display. 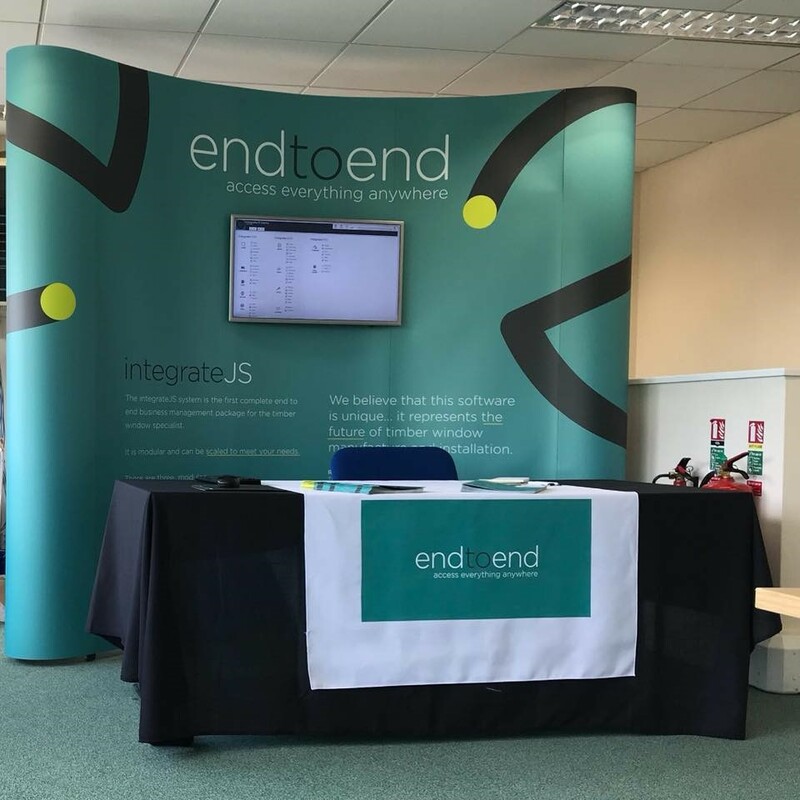 The graphic design possibilities really are endless with linked pop ups because they offer edge to edge marketing exposure, and even come in double-sided for those occasions when you are exhibiting in the middle of a hall. We offer LED lights as standard with all of our pop up display bundles, allowing you to illuminate and highlight your exhibition stand at no extra cost. This saves you money with regards to exhibition costs, as well as enhancing your brand in an eco-friendly and stylish way. Our LED lights are easy to attach and require less plug sockets. They also use a lower wattage than standard halogen lights, further saving you money. With a tool-free assembly and premium laminated graphics, pop ups are one of our core products. If you want something that really stands out from the crowd, inflatable structures are a popular solution. Mostly used outdoors, inflatable structures offer unlimited branding opportunities. We are experts in inflatable advertising, having secured the rights to be official distributors of both X GLOO Event Tents and Signus Inflatables. The X GLOO Inflatable Event Tent is our most popular inflatable structure because of its unmatched versatility. Available in five sizes, the X GLOO is lightweight and compact, but blows up to be exceptionally high impact. It doesn’t require a constant air flow and is fully weatherproof, UV resistant and flame retardant, making it one of the safest inflatable exhibition stand solutions on the market. It comes with a range of accessories, meaning it can work for any event. Signus Inflatables are certainly eye-catching. With three open sides but a circular appearance from above, the Signus inflatable event tent is a unique, modern alternative to inflatable advertising. Signus features three individual canopies which are secured in place with YKK zippers. Customisation is the focus of Signus tents, offering the user full freedom to create a spectacular display. As with anything, exhibitions nowadays are all about the customer experience. People don’t like to be talked at for long periods of time; the best way to absorb information is to create something. If you have a monitor stand or an iPad stand as part of your exhibition display, people are more likely to come over. Interactive exhibition stands appear more enaging and enticing. They give you the opportunity to showcase a brand video that highlights the purpose of your business, or you can create a small competition to encourage people to come over. 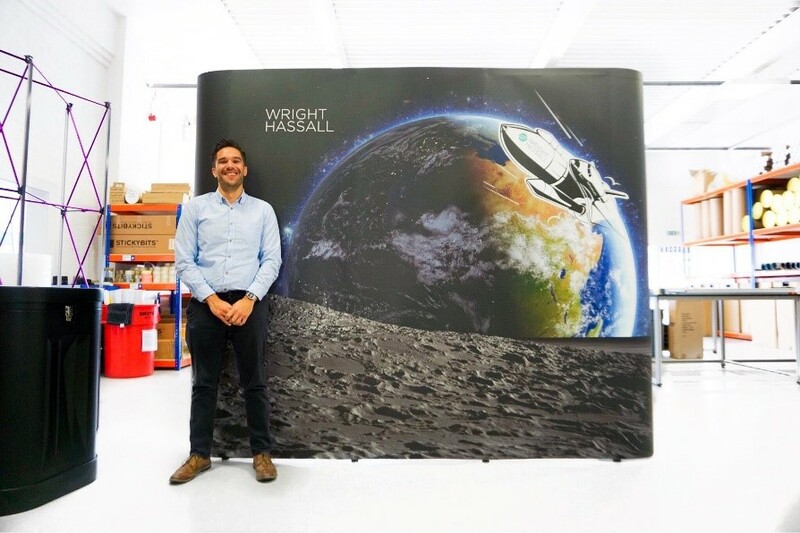 Experiential displays are growing in popularity, making products such as iPad stands and monitor brackets invaluable to businesses aiming to create an eye-catching exhibition stand. With so many people exhibiting at events, all fighting for the same visitor attention and a boost in revenue, it can be hard to make your brand stand out from all the rest. It may seem daunting, but by taking on board and employing the simple tips and tactics listed above, your business stands a solid chance of enticing visitors and gaining recognition from a wider audience without costing you lots of money. For more information on our product ranges or our graphic design service, please contact us or call us on 01733 511030.